You see BannersontheCheap.com are trying to get into a rather niche market: printing custom battle maps for gamers. I’ve been using a basic grid-printed vinyl battlemap for years in my role-play games. In addition to this I’ve also got quite a collection of paper maps which can be quite flimsy – they wear and rip particularly along the folds. Vinyl is much studier so could be handy for maps which you refer to again and again, not to mention you can make non-permanent notes on them with wet-wipe pens. Basically this seemed like a really good idea. 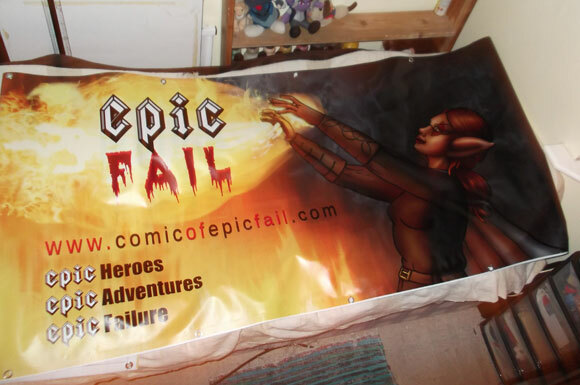 But I ordered a banner, not a map, because I needed one for the front of my stall to advertise ‘Epic Fail’ when I go to Comic Book / Small Press Fairs. I have an idea simmering in the back of my mind that maybe I’ll make a board game sometime and vinyl might work for that? I mean theoretically you could print anything, but it would take me a while to get something like that together. I’ll probably be working on ‘Epic fail’ for a few centuries so a banner would certainly serve me well. They gave me a voucher code so I could get my banner for free and I went through the order process on their website. I ordered a 3′ x 8′ banner which is about the same size as my bedspread! In retrospect probably a little too large but BannersontheCheap.com do them in any size you want. Their sizes start at 2′ X 2′ and go up to 4′ X 30′ at the largest. But having a larger banner is not bad thing since Vinyl is quite thin and flexible, so I could fold it to fit in a smaller space. 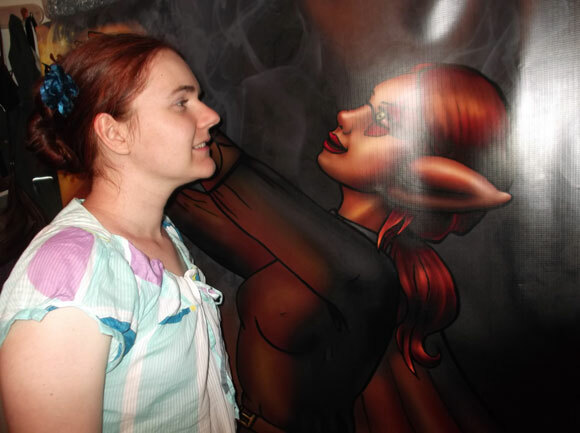 At comic fairs I sometimes get a nice big wall behind me where I can put a big banner, and sometimes I only have a small table where I can hang one in front. When you’ve selected the size you can then use the banner editor on their website to build your design using clipart and text from their library. You can also upload your own images. I used my own design that I’d put together in photoshop, using the image of Amuletts I’d drawn for WAGON. Their image uploader has a size limit of 20MB so I had to shrink my artwork down a bit as I tend to work at a rather high resolution. After that you just have to proof the image, making sure it looks right, and select any other options. You can print double sided if you want but I think it’s just the same design on both sides, plus it adds directional arrows. You also have the option to add hemming and grommets for easier hanging which is an option I took. Without this the my 3’X8′ banner would cost $28.79 and $35.78 with. You would not need grommets for a battle map though (unless you wanted to hang it on your wall or something I suppose). There was a bit of a mix-up because BannersontheCheap.com only ship to America and Canada, and I’m in the UK. But they work with a company called BuildaSign.co.uk that are based in the United Kingdom, so they made my banner for me. Throughout all this they sent me very thoughtful and polite correspondence. The banner arrived and I have to say it looks great! It came well packaged, wrapped around a large cardboard tube to prevent it from being bent and vacuum wrapped in plastic. When I first took it out there was a strong smell of chemicals so I’d recommend unfurling it and leaving it in a ventilated room for a little while if you can. The colours are really accurate and clear. From a distance they look really smooth but close up they’re slightly fuzzy. I seriously doubt anyone would be looking at a banner that closely though, but I think if you’d printed up a battlemap you would be. 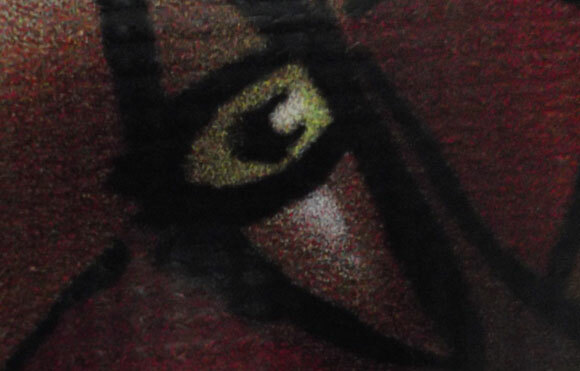 It’s not bad – looks a little like pointillism – but very small text probably wouldn’t be readable. I have included a close-up photo so you can see. It’s just something you’d have to bear in mind when creating your design. The vinyl material is light and flexible with a mesh running though it to make it more durable. The front, on which the design is printed is totally smooth but the back has a rougher texture where you can feel the mesh. As a banner I think it is incredible and I am very happy with it. Amuletts is life-sized on this which looks really cool! As the writing is large and thick it is very clear and readable. A good quality banner that looks very professional and I hope will get me a lot of attention at comic book conventions! Thinking as a role-player about the practicality of using a custom vinyl banner as a battle-map I compared it to the one I have at home and use occasionally in our games. This is blank except for a square grid printed on it, is wet-wipe and uses a very similar material. I googled RPG battle maps online and the smallest I could find cost $22.83 and measured just over 2 feet. The BannersontheCheap 2′ X 2′ banner costs just $9.38. The shipping was higher but even so it still worked out cheaper, and remember that the banner is CUSTOMIZABLE so you can have it printed up with anything you want! That seems like a really good deal! If you would like to see what it looks like as an actual map Scott over at the RPG Blog got one printed up using a pre-generated map from DizzyDragon.net – a really quick and easy option for those of us too lazy to draw out own maps! In conclusion I’m really happy with my banner and think using one as a custom RPG battle map is actually a really practical and affordable option for creative Gamers. I’m very grateful to BannersontheCheap.com and BuildaSign.co.uk for sending one to me for free. I will love it and hug it and call it Timothy.